[WeeklyUniverse.com] Carl Kolchak is legendary as the first modern paranormal investigator -- but shockingly! -- although his exploits inspired The X-Files's Fox Mulder (and influenced Fox TV's Werewolf! 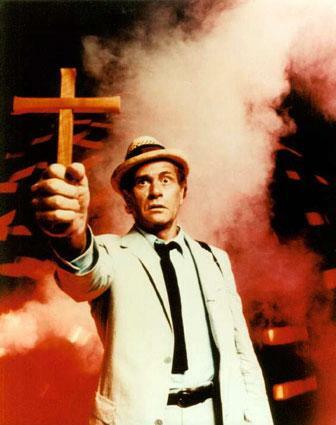 ), Kolchak creator Jeff Rice was cruelly mistreated by Hollywood, and actor Darren McGavin was so disgusted by on-set tension that he begged for Kolchak's TV show to be canceled! Those are some of the startling facts reported in Mark Dawidziak's Night Stalker Companion, a chronicle of the rise and fall and afterlife of Carl Kolchak, hard-boiled paranormal reporter! True-life newspaperman (and actor!) 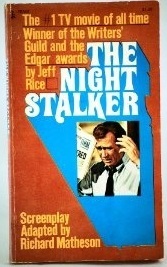 Jeff Rice created Carl Kolchak in The Kolchak Papers, a 1970 horror novel which Rice submitted to Richard Matheson's agent. Then, in a shocking example of Hollywood sleaze, the agent sold the unpublished novel's TV movie rights to ABC -- without first signing Rice! -- trapping Rice in a done deal he'd never agreed to! Heart-breakingly, Rice had hoped to write the TV script himself, but the agent had already secured the teleplay assignment for Matheson. Dawidziak adds: "It's important to note that Rice does not in any way blame Matheson for what he views as shady Hollywood dealings." Once The Kolchak Papers TV movie -- now called The Night Stalker -- was a go, ABC executive Barry Diller tapped Dark Shadows creator Dan Curtis to produce -- but Curtis really wanted to direct! He was already executive producing the final season of ABC's Dark Shadows -- and he hated it! Dawidziak quotes crusty Curtis carping: "I wanted to say good-bye to it so bad I couldn't see straight. We got around to the last year and I was completely tapped out ideawise. And we ended up with some dreadful stories during that last year. It was like being in jail." Despite Curtis's tragic heart-break of being tied to a mega-successful TV show, Dark Shadows did enable him to direct his first feature film -- House of Dark Shadows! (Followed by Night of Dark Shadows.) Which was lucky for the curmudgeonly Curtis, because Diller had already hired another director for The Night Stalker! -- John Llewellyn Moxey (Horror Hotel, aka City of the Dead)! Carping Curtis didn't interfere with Moxey's on-set authority -- and it was a happy set! -- be he'd gripe to star Darren McGavin, "Will you look at the setup Moxey has here. What's he doing?" Despite Moxey's setups, The Night Stalker was a ratings boon when it premiered in January 1972 -- nabbing a household rating of 33.2! But shockingly, Dawidziak doesn't know what it means! He says: "about one out of every three people in the United States was watching Carl Kolchak track Janos Skorzeny."NOT! The household rating is the percentage of households -- NOT the percentage of people. That is, 33.2% of homes had a TV tuned to The Night Stalker -- it doesn't mean every person in that household was viewing it. It doesn't even show "about" how many people in the US was watching it. Even so, The Night Stalker was an astonishing success, and a sequel followed -- 1973's The Night Strangler. And in a heart-warming turn of events, Curtis got his wish and directed it! But there was a dark side! The Night Strangler ended with bad blood between Curtis and star Darren McGavin. Dawidziak says that near the end of the shoot, crude Curtis "was berating the crew something awful." McGavin defended them, then quit. Curtis insisted he stay for closeups, but McGavin retorted, "You've got enough film. Make your movie. Goodbye." Rice's fate was even more tragic -- ABC press kits and trade ads didn't credit him for the first film! Later, when Rice lobbied to script the sequel, he was given the runaround by network and studio executives. 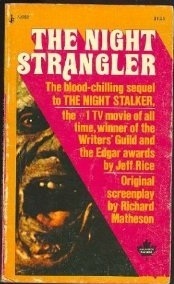 Instead, Rice was relegated to writing the novelization for Matheson's The Night Strangler teleplay. Dawidziak says of Rice's original deal: "No sequels or series could be made without Rice's permission." Apparently, Rice didn't press his advantage -- for the time being! Then came the Kolchak TV series. Amazingly, no one informed Rice about a series in the works -- even though his contract forbade a series without his permission! Rice learned of ABC and Universal's plans for a series from Daily Variety (April 24, 1974). Still Mr. Nice Guy, Rice tried to coax Universal into actually paying for the rights it was already using, while simultaneously working on script ideas for the show and a contract for future novelizations. In August -- four months later! -- Rice's lawyer finally requested that Universal "settle the rights question." Universal rewarded Rice's patience by barring him from the lot! His calls were no longer returned. His novelization deal collapsed. Rice sued six months later, in March 1975, shortly before the series was canceled. The suit was settled nine months after that. Rice never made it in Hollywood, either as scribe or actor (his promised role in the first film had also fallen through). Maybe he was branded a trouble maker. At the time of Dawidziak's 1997 book, Rice was working as a certified paralegal. But McGavin was determined to produce -- and keep Universal to its word! -- so once on the set, he acted as de facto producer! The resulting clash of "producers" created on-set turmoil and tension, and Playdon quit after two episodes. Replacement producer Cy Chermak failed to ease tensions. Long hours and all-night shoots increased pressures. By February, McGavin was begging studio and network to cancel the show. Dismal ratings granted his wish. Tragedy continued stalking The Night Stalker. In the 1980s, the series was syndicated on CBS Late Night, and in the 1990s on the Sci-Fi Channel -- with four episodes missing! These "lost episodes" ("Fire Fall" aka "The Doppleganger"; "The Energy Eater" aka "Matchemonedo"; "Demon in Lace"; "Legacy of Terror") had been re-edited into two TV movies, The Demon and the Mummy and Crackle of Death, and were thus legally unavailable to Kolchak fans in their proper format! Heart-warmingly, the episodes became available again when Columbia Home Video released the entire series on VHS in 1996! (Ten tapes to the set, two episodes per tape). Amazingly, The Night Strangler TV movie suffered its own bizarre saga of "lost scenes"! ABC initially released a 74 minute version for American TV -- but a 90 minute version for overseas theatrical release! Even more amazingly, this longer version has occasionally been broadcast in major US markets (such as Cleveland and Detroit)! But most amazingly of all, rumors hint that there may be still more footage lurking in ABC vaults! Despite its woefully tragic history, Kolchak continued to influence and inspire! Dawidziak says that many journalists have cited Kolchak as an influence in their deciding become journalists! The werewolf villain in Fox TV's 1987-88 series, Werewolf, was named Janos Skorzeny -- same as the vampire villain in the The Night Stalker! Kolchak has also been cited influencing for Chris Carter's The X-Files! "I just wanted to do something as scary as I remember The Night Stalker was when I was in my teens," said Carter in Frank Lovece's The X-Files Declassified. The rumored meeting between Fox Mulder and Cal Kolchak was never to be -- but Darren McGavin did make a guest appearance on the show! And Jeff Rice wrote the Foreword to Ted Edwards' X-Files Confidential: The Unauthorized X-Philes Compendium. Kolchak has also maintained continuing close contact with TV's Dark Shadows! Dan Curtis, composer Bob Cobert, and actress Lara Parker all worked on both Dark Shadows and Kolchak projects! Parker, best known as Dark Shadows witch Angelique, played a witch in the Kolchak episode: "The Trevi Murders." 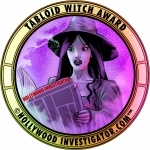 And Dawidziak's Night Stalker Companion was published by Pomegranate Press, founded in 1986 by Dark Shadows actress Kathryn Leigh Scott to self-publish My Scrapbook Memories of Dark Shadows! Her book's astonishing success induced her to release additional Dark Shadows books. But heart-warmingly, despite his Kolchak tragedies, Rice would not let Kolchak die! Dawidziak reports that, for years, Rice tried to launch a series of Kolchak novels and comic books, but saw two factors blocking him. Publishers "keep trying to acquire the rights for pennies and balk at paying Rice nearly anything at all, doing their best to keep Rice from doing any writing if possible." And Rice fears "that deals are fashioned with the intention of keeping Kolchak locked up and off the market." Finally, in 1994 -- over twenty years after Rice's The Night Strangler novelization! -- Kolchak finally returned in a third novel, Grave Secrets. Amazingly, Grave Secrets was penned by Mark Dawidziak and released by Image Publishing (the folks behind Dawidziak's 1991 Night Stalking: A 20th Anniversary Kolchak Companion, an earlier version of his revised Night Stalker Companion)! But still, Rice would not let Kolchak die! 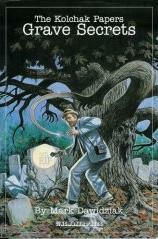 Five years after Dawidziak's Night Stalker Companion, Kolchak returned in a series of graphic novels (comic books) released by Moonstone Books! In an exclusive statement to the Weekly Universe, Moonstone publisher Joe Gentile says, "Jeff Rice has been involved [in the comics] from the beginning. He has approved everything that we have put out so far." Moonstone scribe Stefan Petrucha says, "Jeff's notes and compliments on my Devil in the Details script was one of the highlights of my career. It was very gratifying to know that the creator so enjoyed my work with his character. 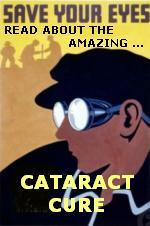 And the books are going over like gangbusters with critics, old fans, and newcomers alike!" Because of Carl Kolchak's complicated contractual history, the Weekly Universe asked about Moonstone's use of Darren McGavin's image. Did Moonstone license McGavin's image from McGavin or from Universal? Gentile replies, "Universal has no involvement, since their rights do not involve new stories of the Kolchak character. They do own the rights to the TV episodes (only the ones aired), but only the images from them. Jeff owns the character." Tantalizingly, Gentile adds, "Kolchak has been optioned for film yet again. Nothing is set in stone, of course." The 1972 TV movie that introduced investigative reporter Carl Kolchak to the world. Kolchak tracks vampire Janos Skorzeny (also the name of the werewolf villain in Fox TV's 1987 series, Werewolf). The second Kolchak TV movie (1973). Kolchak tracks an immortal Jack-the-Ripper/mad scientist (John Anderson, best known as Oscar Goldman in The Six Million Dollar Man and The Bionic Woman). Set in Seattle's underground city (which is a lot less impressive in real life than in this film). Both of the above VHS movies on one DVD! The entire TV series was released as a VHS set (ten tapes, two episodes per tape) by Columbia House Video Library, beginning in October 1996. Includes the four "missing episodes" never seen on CBS Late Night or the Sci-Fi Channel. Out of print, but copies still turn up on Amazon's Z shop and Ebay. The series is now available on DVD. To be published by Gauntlet in October 2003. Some people claim that Matheson's scripts "saved" Rice's novel. Decide for yourself! Based on Rice's unpublished novel, The Kolchak Papers. Published by Pocket Books in December 1973, initial print run nearly 500,000 copies. Sold well, but was famously panned by Stephen King in Dance Macabre. Reprinted in hardback & trade paperback in 1993 by Image Publishing's Cinemaker imprint with a foreword by Stuart M. Kaminsky and art by Kevin Barnes & Sterling Clark Jr.
Rice's novelization of Matheson's script. Pocket Books, January 1974. The failure of this poorly distributed 1994 novel (from Image Publishing's Cenemaker imprint) tanked plans for future Kolchak novels. However, in 2003, the Weekly Universe spotted an out of print copy selling for $185. Released by Image Publishing in 1991. Out of print. An update of the above book, this Kolchak history includes an in-depth TV episode guide. Released by Pomegranate Press, best known for their Dark Shadows books. 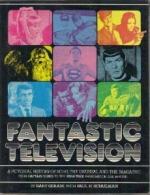 A hardback with chapters and episode guides to horror/sci-fi TV shows from the late 1950s to early 1970s. Entries include Kolchak: The Night Stalker, plus The Twilight Zone, The Outer Limits, Land Of The Giants, Voyage To The Bottom Of The Sea, One Step Beyond, Night Gallery, and some others (but NOT Ghost Story or Circle Of Fear). Released in the 1970s. Out of print. Apparently reprinted by Crown in 1999, but the Weekly Universe has details on whether the new version was updated. Horror collection, includes a reprint of "Stalking the Truth," a brief comparative analysis of Carl Kolchak and Fox Mulder (of The X-Files) originally published in Sci-Fi Universe (Dec. 1997). Also contains fiction, film analyses, and an interview with Dark Shadows actor Jonathan Frid (originally published in Filmfax # 83, Feb/March 2001). Episode guide with analysis. Originally released in 1996, the revised 1997 edition covers the first four seasons. Being "unauthorized" there aren't any photos from the show, although a few promo photos of the actors. Kolchak the Night Stalker, by Jeff Rice. Art by Gordon Purcell, Terry Pallott, Ken Wolak, Ken Meyer Jr. The first in Moonstone Press's series of Kolchak graphic novels. Rice's adaptation of the first TV movie. Gentile's script partially adapts an unfilmed episode from the TV show. Released in March 2003. First original Kolchak story as a graphic novel. Released in February 2003.